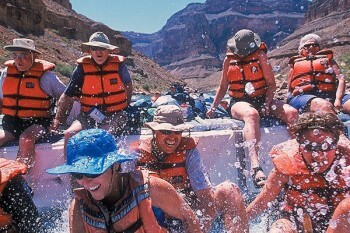 Our family was lucky enough to enjoy this exciting rafting trip together. It was a thrilling family adventure for three generations -- a journey through the spectacular and exciting Grand Canyon. My husband and I (the grandparents) will treasure every moment of participating in and watching our children and grandchildren experience the beauty and excitement of riding the rapids through the Grand Canyon. There were 11 of us on the trip -- 2 grandparents, our 3 children and one of their spouses, and our 5 grandchildren, ages 11 to 18. The experience gave us memories we will share forever, and it brought all of us closer as a family. The guides were great, the canyon was exciting and gorgeous, the hikes were challenging and rewarding, the food surpassed our expectations. I'd recommend it to anyone who wants a bit of adventure in their vacation.